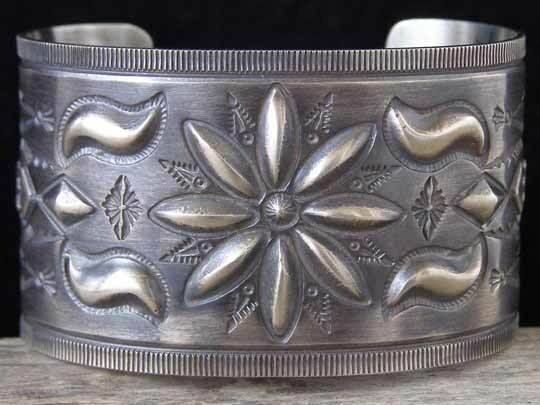 Stanley Parker Repoussée Bracelet size 6 5/8"
This bracelet by Navajo silversmtith Stanley Parker is exquisitely detailed. From the repoussée motifs to the decorative stampwork, this is an example of flawlessly detailed workmanship. Stanley gave this piece an oxidized finish to give it an "old pawn" look. This is a fine piece of Navajo Traditional Revival jewelry. Hallmarked S Parker in script and stamped NAVAJO and STERLING inside. Uniform width of cuff: 1 1/2"